The provocative KOBE 9 Elite embodies Nike’s singular focus on delivering innovation that makes athletes better. Evidence of Nike’s passion to simultaneously push the limits of design is best proven in the details. 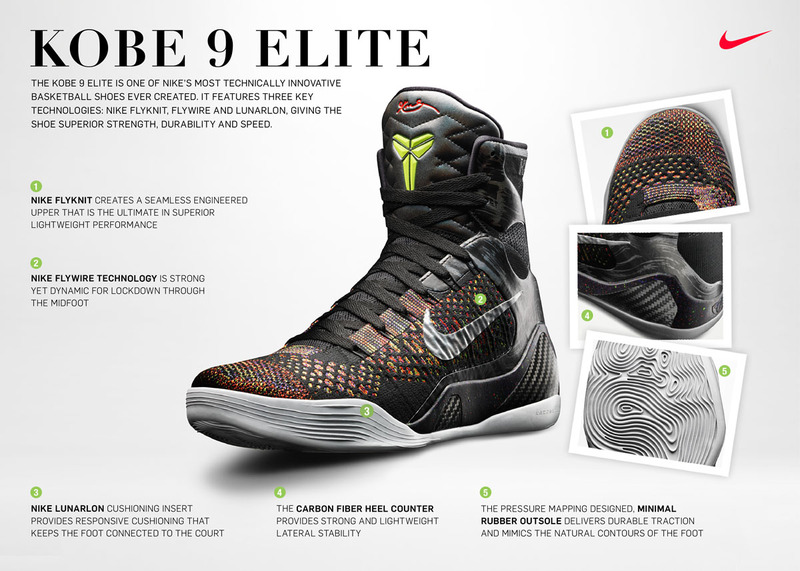 In this exclusive look at the KOBE 9 Elite Masterpiece we decode the creation of this striking shoe by sharing nine design details from Nike designer Eric Avar. KOBE INSIGHT #1: I WANT TO FEEL THE COURT. Performance result: This combination puts the foot in close contact with the court surface, allowing agile cuts, quick response and tremendous court feel. KOBE INSIGHT #2: I’M LOOKING FOR A HIGH-TOP THAT FEELS LIKE A LOW-TOP. Performance result: Allows a natural range of motion, proprioception and an intuitive fit with the lightweight feel of a low-top. The collar is high, but there are zero distractions or restrictions. KOBE INSIGHT #3: MAKE IT PERSONAL. Performance result: Toughness. These sutures represent Bryant’s commitment to recover from a torn Achilles. KOBE INSIGHT #4: I WANT TO MOVE WITH THE QUICKNESS OF A BOXER. Performance result: A natural feel of the upper, combined with sole that “moves with you,” allows basketball movements that mimic the footwork you see in a boxing ring. 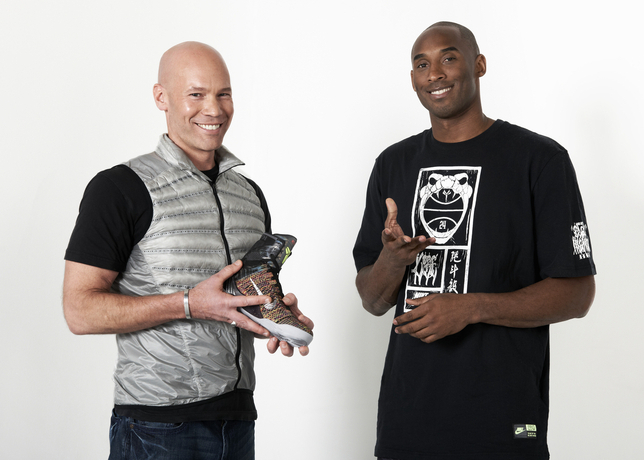 KOBE INSIGHT #5: USE THE BEST MATERIALS. Performance result: The combination of high-performance materials are lightweight, responsive, strong and durable. For a player like Bryant who runs more than four miles in the average game, shedding weight without compromising strength makes a significant impact. KOBE INSIGHT #6: COMFORT IS KEY. Performance result: In tandem with the Flyknit, the quilted tongue and inner bootie provide a comfortable, glove-like fit. KOBE INSIGHT #7: INJECT SOME CHAOS. Performance result: Distinction on the court. Absolutely no pair of the Masterpiece colorway are the same, they are all unique – like snowflakes. The Flyknit creation process weaves a one-of-a-kind upper so that no shoe is the same; the color blend is different on each shoe. KOBE INSIGHT #8: I WANT TO STOP AND CUT ON A DIME. Performance result: With an outsole traction pattern that provides maximum grip, no slipping and sliding on the court. KOBE INSIGHT #9: KEEP PEOPLE GUESSING. Rumored to be Flyknit, high I believe, can't confirm that. Edited by lnsaccount, March 27, 2014 - 09:27 AM. Will they be available at Payless? That's only the high top. A low top version is expected and the Venomenoms will finally reach stateside. Got all this info from NT, just like that KoC article that's a direct quote from the thread. Edited by Piston Honda, November 10, 2013 - 09:01 PM. You have more info on this? 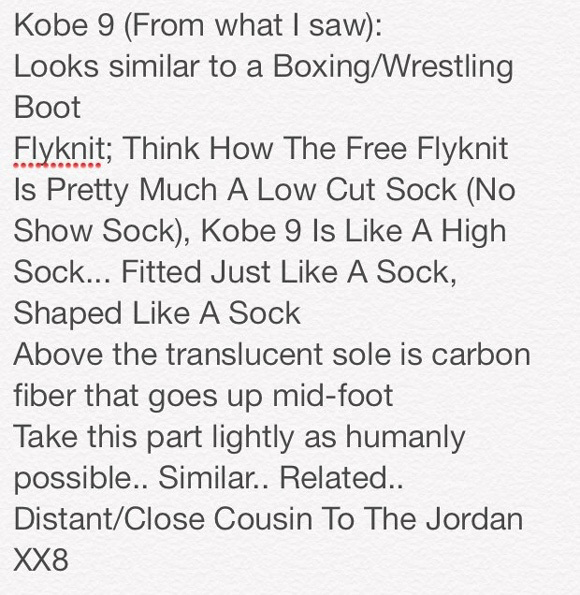 I always rock the kobes to ball in, but if these rumors are true its not sounding good for the 9s. I dont want no shoes similar to MJ 28 coming out under Kobe brand. Went shopping for kicks yesterday & it's kinda sad how there's no new Kobe gear on the shelfs or racks right now. Yeah, same. Lots more LeBron stuff. Three or 4 years ago they had a huge Kobe section in the mall. I live in Pennsylvania, though. (Leaving soon! excited) It's hard to find Lakers stuff around here. I'm in Austin & even the outlets up the highway in Round Rock use to have some Kobe stuff. Not this time around. Not even one pair of shoes. Not a t-shirt/shorts. But I'm certain it'll change soon. My last were these beauties. Is he going to release a low version? With the right colorway they will be copped. Can't wait to see the final model though. The Kobe 8's were fire but the sample model was very blah when it leaked.